Forza Horizon 4 is packed with beautiful cars that will give you speed you probably won’t experience in real life. In this game, cars can be obtained in multiple ways. For e.g. 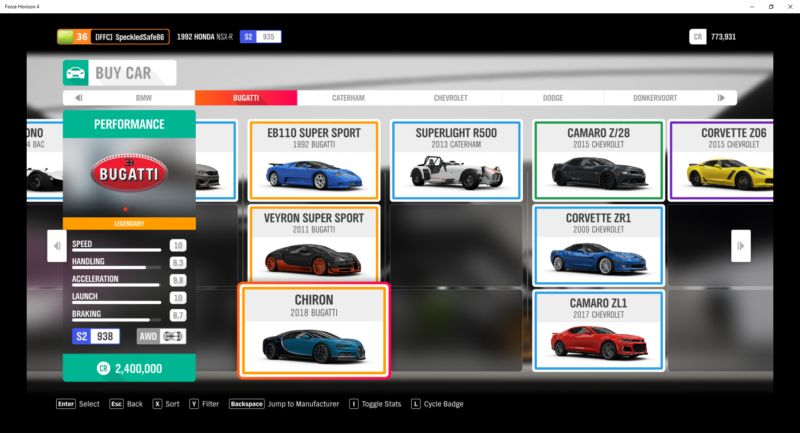 you can either buy vehicles from the autoshow or an auction, get from race events, from Wheelspins (or Super Wheelspins) and even retrieve them from Barn Finds. With so many vehicles in the game, how do you choose the best or the fastest? 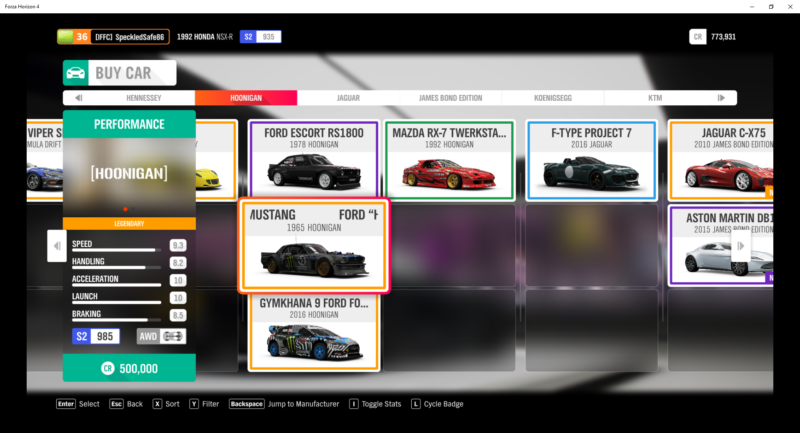 Fret not, here’s a list of 10 of the best cars in Forza Horizon 4 and they are ranked based on which car is the fastest. We used speed as the metric and did not include the fact that you can always tune cars to get maximum speed. These are based on default settings instead. 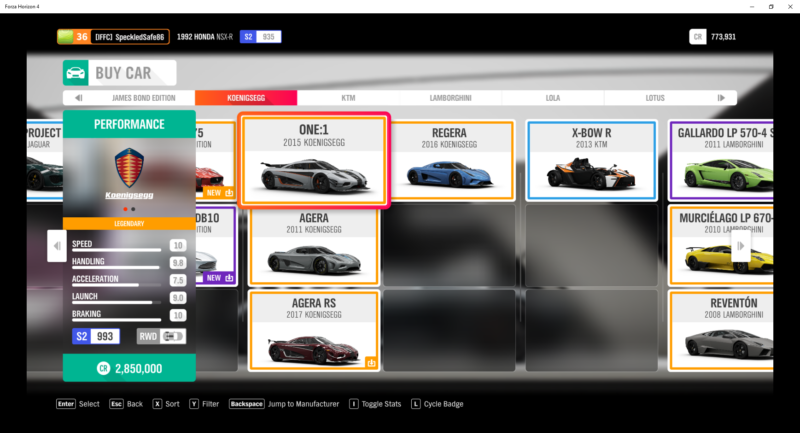 The first on the list is a Koenigsegg Regera, which so happens to be the slowest Koenigsegg in this game. Even with an incredible speed of 9.2 by default, it’s still the last on this list. And no, you won’t see any Lamborghini cars on the list nor any Porsche. Even with a high speed, it does have rather high handling attributes, making it a suitable car to buy for your garage. The acceleration is a little slow though. You can buy this for 1,900,000 CR. 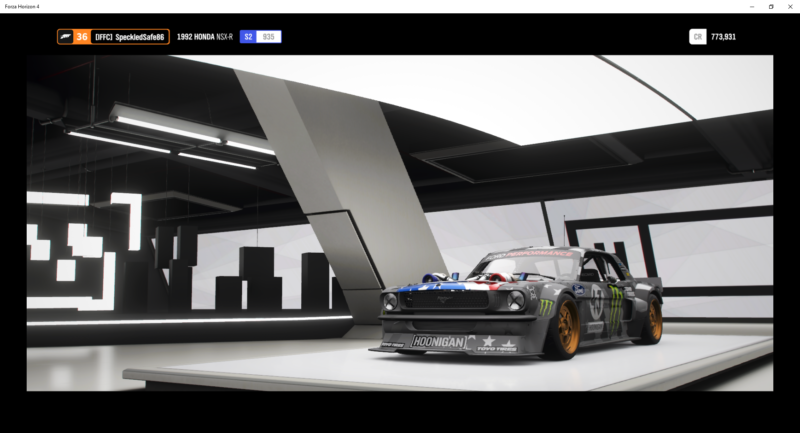 Next up is the Ford “Hoonigan” Mustang, which happens to make this list based on the speed of 9.3. Despite not having a body typical of other super cars here, it’s one of the fastest cars on this list. It has a perfect score for acceleration and launch as well, which may actually be better than a Regera or other super cars in a race. It only has a price tag of 500,000 credits, clearly the cheapest on this list. Number eight on this list is none other than the McLaren P1 and it packs the speed of 9.3, similar to the Hoonigan. It does have pretty good stats all round with acceleration being its weakest point. 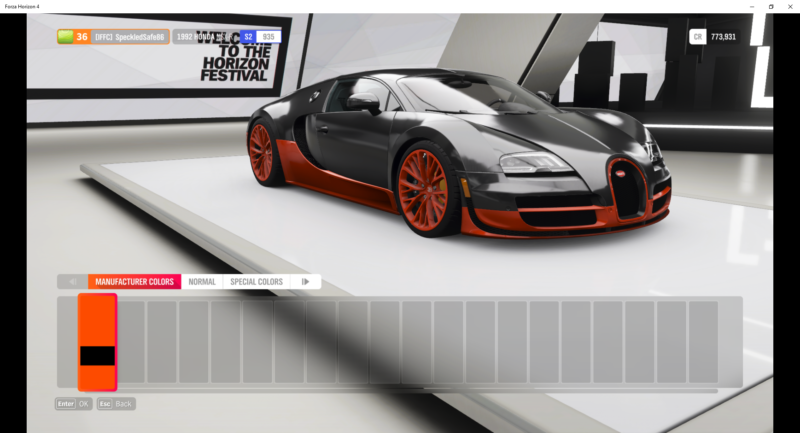 You can get this for 1,350,000 credits at the autoshow, or even cheaper at the auction. The next car on this list is from Ferrari and its make is better known as LaFerrari. It’s supposedly a hybrid sports car in reality. With a speed of 9.5, it’s only at the number seven spot but it’s still a great ride if you get your hands on one of these. It also comes with near perfect handling and pretty decent acceleration plus launch stats. You can get LaFerrari for 1.5 million credits at the autoshow. Another Koenigsegg to be featured on this list of fastest cars is the Agera (2011). It comes with a default speed of 9.6 and an overall decent stats. Its acceleration is a little on the low side though. Of course, all of this can be tuned to get better stats. With a price of 1.5 million CR as well, it’s definitely worth buying. No top 10 list of best cars is complete without a Bugatti and this make in particular is the Veyron. With a close to perfect speed of 9.9, it comes at number 5 on this list. Its other stats like acceleration and launch are really high as well, which is great for race events. 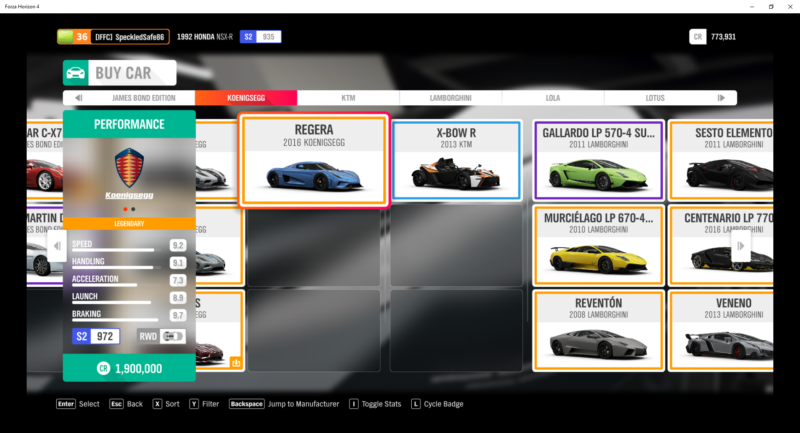 It does come with a much bigger price tag of 2.2 million credits compared to the other cars featured above. That being said, it’s worth saving your credits to get one of these. Koenigsegg is well known to make some of the fastest cars in the world in reality. 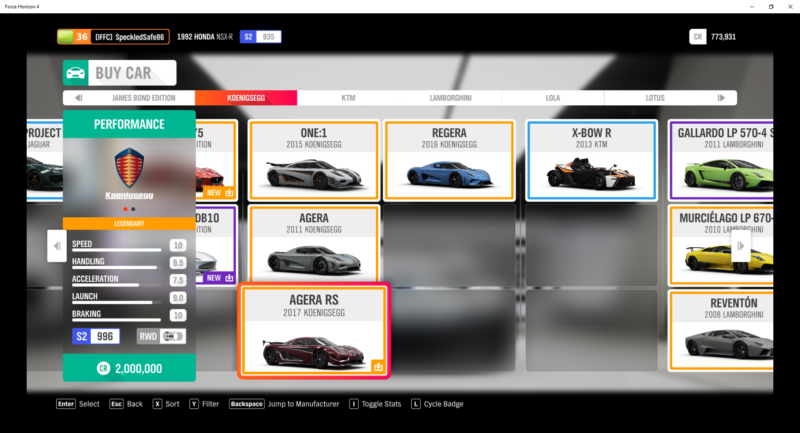 That doesn’t change in this Horizon 4. 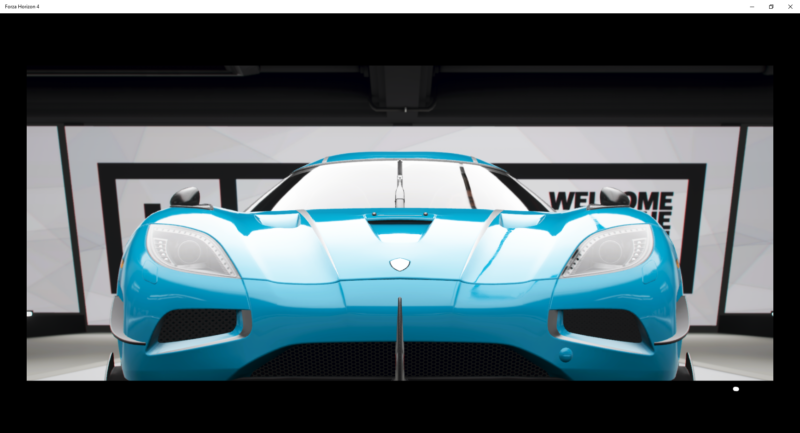 Koenigsegg One:1 comes at number 4 of this list but that being said, it already has a perfect speed of 10. The only thing it needs more is a higher acceleration. Even with the price tag of a whopping 2.85 million credits (highest on the list), it’s still worth considering. Of course, you could always buy a couple of properties with that price or even Fairlawn Manor at 2 million to unlock fast travels anywhere. Nonetheless, the whole purpose of the game is driving so it’s definitely worth the buy. An even faster Bugatti on this list is the Bugatti Chiron. This car packs a perfect speed of 10 as well, with really high acceleration and launch attributes. It comes with a pretty hefty price tag of 2.4 million credits, just like in real life. Perhaps the only time you (and I) can drive this car is in a game like Forza Horizon 4. 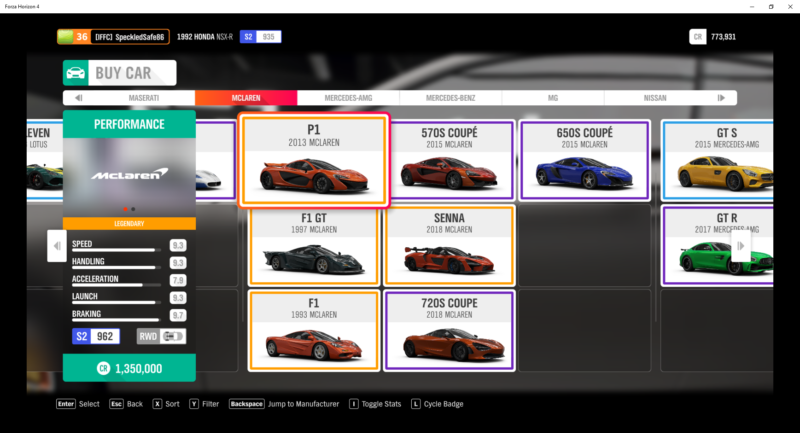 It was difficult choosing between the second and first spots since all of these cars have perfect in-game speeds. Also one of the fastest cars in Forza Horizon 4 is the Koenigsegg Agera RS, which is also the newest car among the four Koenigseggs listed here. It comes with the top speed of 10 and has pretty good handling at 9.5. It lacks a little on acceleration though. The Agera RS is special at the time of writing, as you need to acquire the car pass for this. I tried buying it but was only led to the checkout payment and was not given an option to purchase with in-game credits. That being said, you can probably buy it from the auction or in the future when some other car becomes part of the car pass. Or maybe there’s a way to buy it but I missed it. It’s definitely one of the best cars in the game and you should aim for it if you love speed. 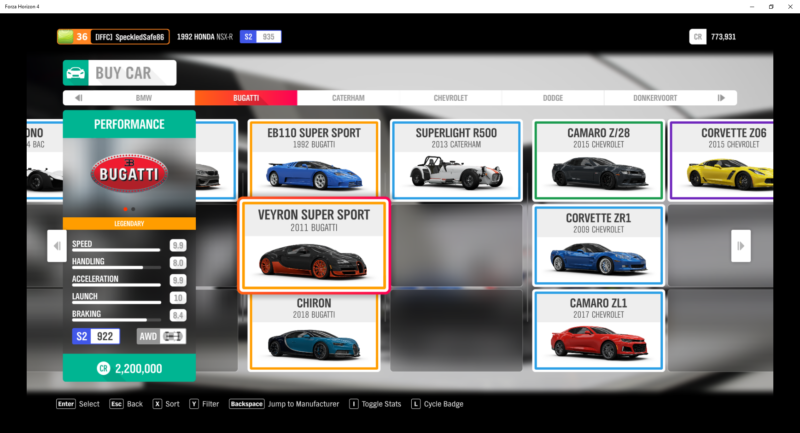 The number one on this list is the Venom GT, also with a perfect speed of 10. 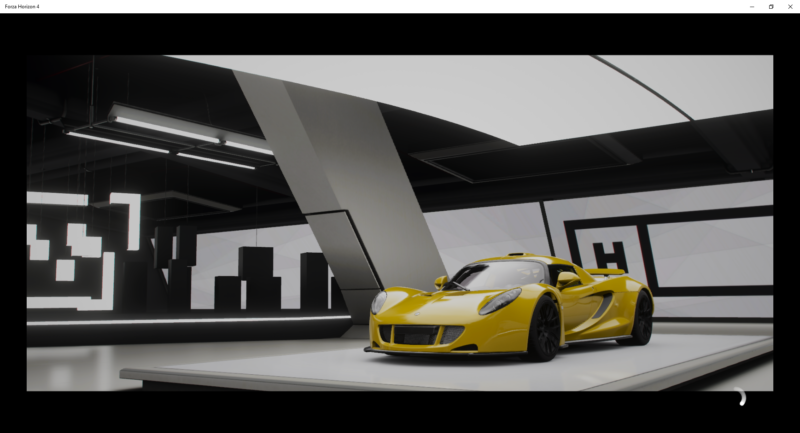 In reality, the Venom GT may have recently lost to the Agera RS slightly in terms of maximum speed, but it used to be known as the fastest. It has great stats overall but its acceleration is slightly lacking. With the price tag of 1.2 million credits, it’s clearly cheaper than the rest and easier to buy. 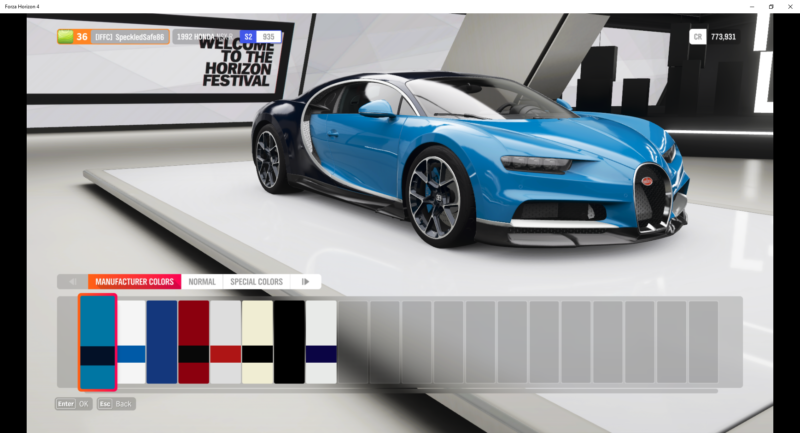 Which is the best car in Forza Horizon 4 in your opinion? 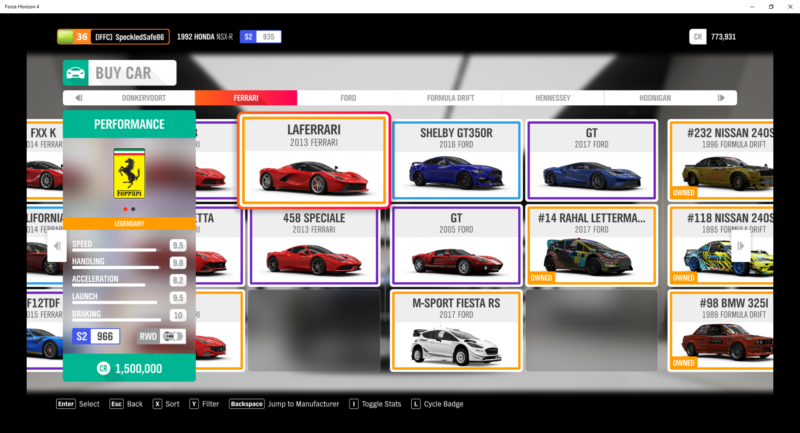 We have listed 10 cars that are incredibly fast and were based on the default speed metric alone, not taking into account tuning. You can always take any car in this top 10 and make it the best car for you with the right tuning and customization. That being said, what do you think is the best or fastest car in the game? I have found the Lamborgini Aventador FE to be the best car that I have. 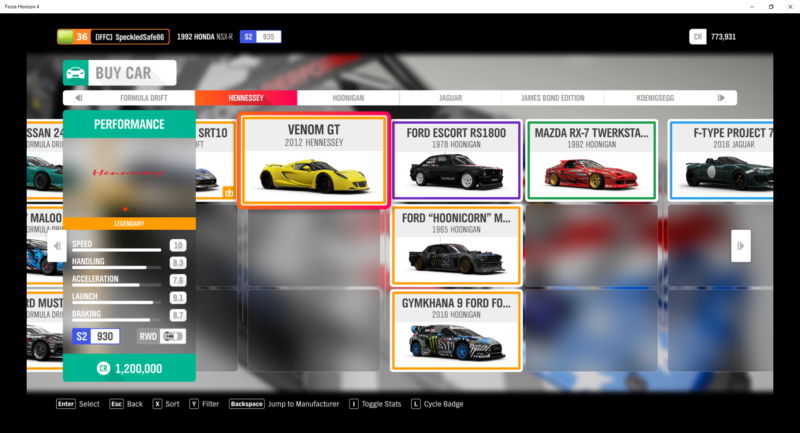 I and my 6 man convoy were racing in the fastest cars in the game(They used most of the cars on this list), On every race except for the Dirt Rallies, I won with the Aventador FE. I have made my own tuning to give a drag car feel, but I still use it for other races. I went head-to-head with a Venom GT and an Agera RS on the 0.5-mile drag strip, I beat both by about 3 seconds. So in my experience, the Lamborgini Aventador FE is the best and fastest car. Agreed. With its launch and acceleration and 1500HP reactor under the bonnet, My Aventadore eats Bugattiis for lunch i have yet to be beat by anything other then anothe Aventadore. Mabye not the highest top end but there isnt enufe open road to get that mithical 285.